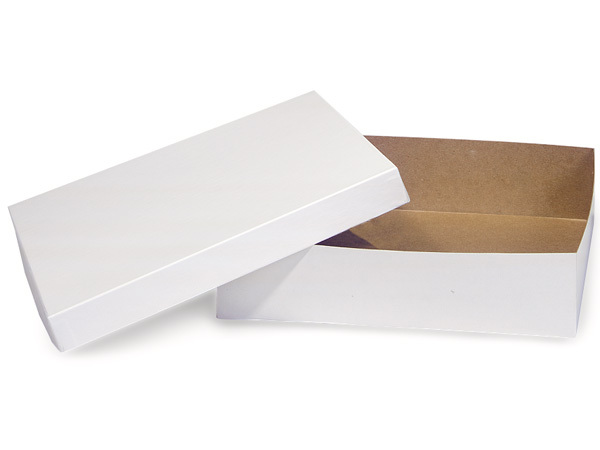 White box base 12x12x3". Folding box bases and rigid lids are sold separately so you can mix and match colors. Our Hi-Wall Gift Boxes and Lids are sold separately so you can mix and match! Choose your own color of lid! The bottom base of the box features a double lock bottom and has a grey claycoated newsback board interior and a semi-gloss finish. The rigid lid with a clean white interior and gloss finish, gives your box and upscale and finished look. Made in the USA and 100% recycled. A food safe barrier like food grade tissue or cello for food packaging.